With cold and slippery times a head of us we need to prepare ourselves. For example by searching for the perfect fall and winter sneakers. Very convenient; trendy, comfy and low(er) risk at slipping when snow and ice sets in. Finding them is not that hard, stroll in any random shoe shop or department store and you’ll have more then enough choice. But how do you wear them? Nowadays it is perfectly fine to pair them with a skirt, pantalon or any other business or high fashion outfit. There are pretty much no limitations; everything is allowed. This should make things easier, but too many options often means we don’t see the wood for the trees anymore. But Bowl Of Style comes to the rescue; I found 17 how-to-wear-sneaker-rules that make sure you are fashionable and comfortable in sneakers this winter! It’s easy as pie: jeans + tee = OK. Add a beanie or to-die-for scarf to spice things up. Pair an all-black or white outfit with a smashing colored sneaker. Pair an studded or embellished pair of sneakers with a simple dress and (jean) jacket. Wear your midi skirt with sneakers and you will instanly look younger and casual. Kind of unexpected but very trendy this fall; wearing shorts with (dark) thights and sneakers. Grab your BF’s plaided shirt, put on a beanie and sneakers and you are good to go. Make your maxi dress winterproof by adding tights, sneakers and a beautiful jacket. Wear you animal printed sneakers with a classic Breton-stripped shirt of Polka-Dot blouse. To make your summer dress winter appropriate just add a long knitted cardigan, scarf, tights and fashionable sneakers. Roll up your jeans or pants to give your sneakers the attention they deserve. Make your button-down shirt more casual by wearing it with sneakers. 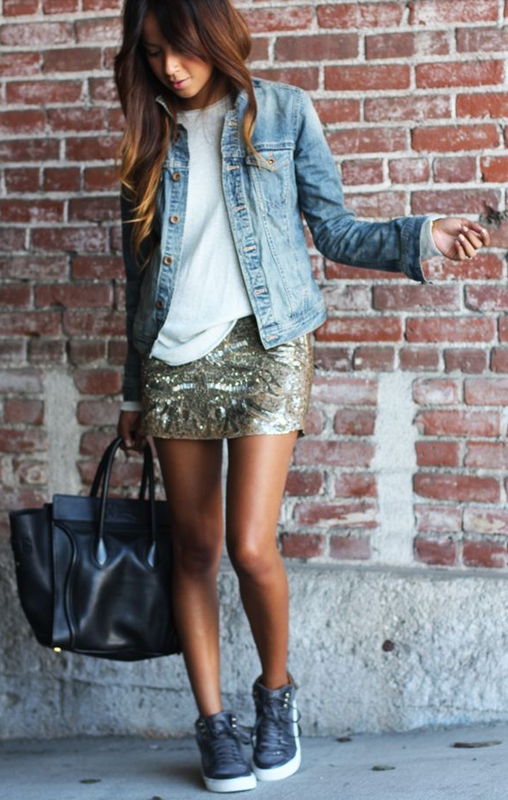 When worn with sneakers sequins and beading is totally appropriate during the day time. Mini skirt + sweatshirt + sneakers = perfect combo. To add some boldness to your outfit go for a statement lipcolor. Pair printed pants with sneakers for a very comfy but fashionable outfit. Leather pants are pretty risky, but by adding sneakers you make your look instantly casual. All you need to do to make your dress-and-tights-outfit appropriate for a day around town is adding sneakers. 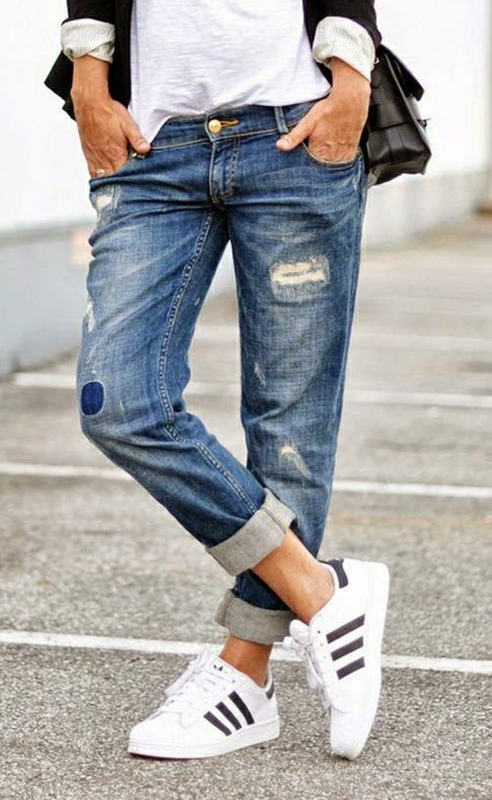 Wearing sneakers with a jeans and blazer makes the perfect simple-but-classy-outfit.